Leaving from the Lake St Clair Visitors Centre, the Shadow Lake Circuit is a fascinating 12km walk that weaves its way through 3 strikingly different forest types; highland eucalypt forest, sub-alpine moorland and rainforest. Situated below Mt Hugel, Shadow Lake itself is beautiful and provides a picturesque spot to stop and explore. The trail is clearly marked and mostly well maintained underfoot. Climbing only 270m throughout its duration, the Shadow Lake Circuit makes a great 4-5 hour family walk for anyone visiting the Lake St Clair National Park. View Google Map Directions From Hobart, head north on Brooker Avenue, taking the first exit just before the Bridgewater Bridge onto the Lyell Highway, continue for 140km to Derwent Bridge. Once at Derwent Bridge turn right onto Lake St Clair Rd. The Shadow Lake Circuit walk begins just behind the main Parks and Wildlife Building. 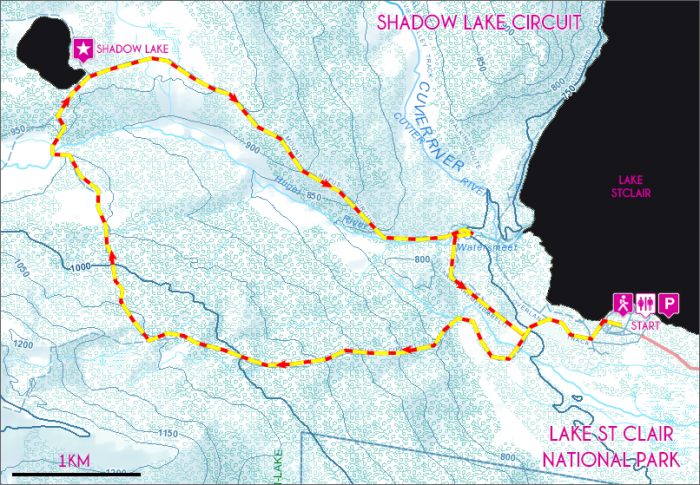 Beginning from the Visitors Centre, the Shadow Lake Circuit can be walked comfortably in either direction. These notes outline the walk done in a clockwise direction, resulting in steeper initial uphill sections and gentler downhills later. 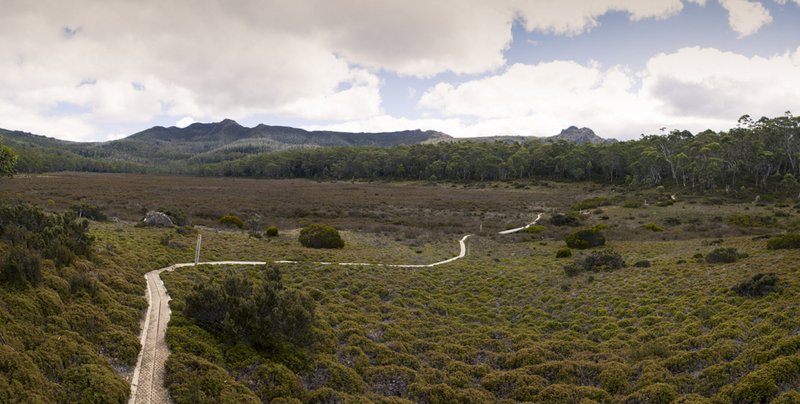 Following the signs from the Visitors Centre, we first head west via the Mt Rufus track. 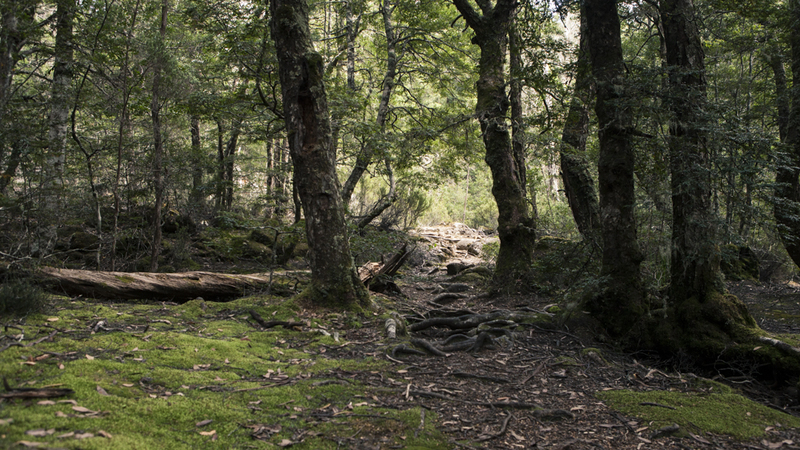 This trail passes through vast eucalypt forest, occasionally dropping down into rainforest gullies filled with lichen and moss covered rocks. During this first 5km a series of steep but short uphill sections will be the only climbs experienced throughout the day’s hiking. After 90 minutes or so the eucalypt forests begin to change to incredible sub-alpine vegetation filled with towering snow guns. The well signposted turn off to Shadow Lake is then spotted as Mt Rufus comes into view. An extended circuit taking in Mt Rufus can be followed further west requiring an additional 2 hours. Heading north towards Shadow Lake the sub-alphine moorlands open up, crossing a broad plain beneath the face of Mt Rufus via duckboards before re-entering the denser forest. 30 minutes later Shadow Lake is reached. Surrounded by beautiful sub alpine pencil pines Shadow Lake is stunning. Multiple points of entry to the Lake’s shore also provide ample room to stop for lunch. Be sure to keep a keen eye out for the local platypi that call this lake home. 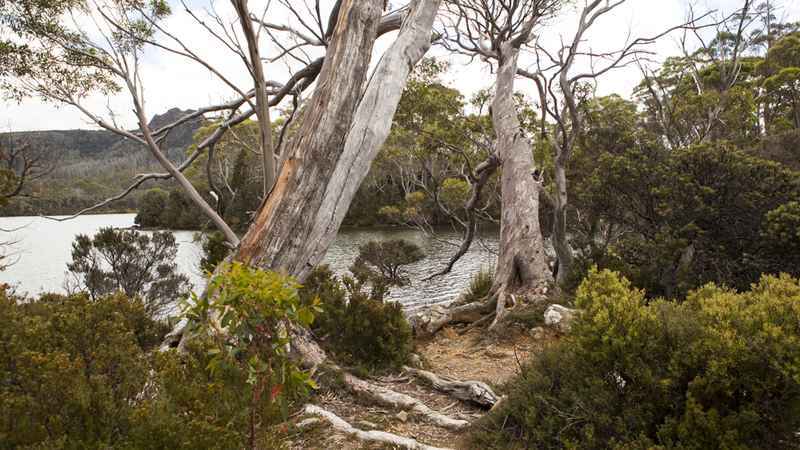 From the eastern side of the lake, a 40 minute return side-track along raised boardwalks takes you to Forgotten Lake along the Mt Hugel track. Heading back from Shadow Lake, the trail leaves the sub-alpine forest and leads gently downhill through thick rainforest vegetation. During winter or after heavy rain, sections of the trail here can become quite wet and care should be taken when stepping between stones. After an hour or so, the trail meets the Hugel River and skirts its edge for the remainder before reaching Watersmeet, where the Cuvier and Hugel Rivers join. From Watersmeet, a short 30 minute return loop to the north takes you to Platypus Bay. Or continuing on for 15 minutes to the south, the Lake St Clair Visitors Centre and original trailhead is met. Overall the Shadow Lake Circuit is a brilliant family walk that highlights just some of the unique and beautiful landscape making up the Lake St Clair National Park.